The Mobile Dev + Test Conference will be held at the Manchester Grand Hyatt, recently named one of the "Best Meeting & Conference Hotels In the U.S." by Groups International. 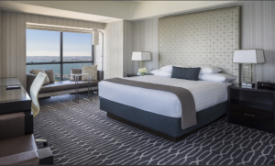 Stay at the Manchester and you'll wake to the sun sparkling off San Diego Bay each morning and enjoy luxurious hotel features with the comfort and amenities that the business traveler has come to expect. 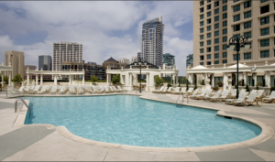 Relax after your meetings in the fourth-floor pool overlooking the Bay or soak up the California sun at the boardwalk. Look forward to experiencing legendary quality and outstanding service at the Manchester Grand Hyatt. Networking opportunities will be around every corner and inside every elevator at the Manchester Grand Hyatt. Save time getting to and from the sessions and exhibits—while enjoying the convenience of going back to your room between events to make phone calls and check emails. Plus, you're just footsteps away from additional dining and entertainment in Downtown San Diego! 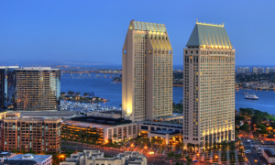 When it’s time to get down to business, no hotel does it better than Manchester Grand Hyatt San Diego. Discover a unique urban retreat in the heart of San Diego. CALL the Manchester Grand Hyatt!—Call Manchester Grand Hyatt reservations at 888.421.1442, available Mon–Fri from 8am–5pm PT. When calling, be sure to mention the Mobile Dev + Test conference to get the special conference rate. If you need special facilities or services, please notify the agent at the time of reservation. * Cancellations on a guaranteed reservation must occur more than 5 days prior to the specified arrival time to ensure a refund.